Last weekend as I was resting due to a bit of a head cold, I took the opportunity to clear out some old client files. Yes, I admit there were two boxes of data going back quite a few years that needed sorting. While checking them to shred old information and notes, I got intrigued by the goals and things people wanted help with. As I have quite a good memory and am still connected with some of these people, I became mesmerised by comparing the people and goals with current results. Overall, I realised how fortunate I have been to help so many people transform their results, and in many instances, their lives. However, I noted that a few people gave up after one or two sessions. I concluded, there are two different types of people. The ones who committed to their success even if they felt very stuck sceptical or slightly fearful. Because they showed up and stuck with it, they got great results. One, in particular, Tim Adams, who I have known for over 9 years has gone on to create the most phenomenal results. Back then his goals were to win the Australian Barista Championships and then open up his own cafe. He came to work with me to ensure his Mindset was 100% set for success. Check out what else he has done since on this video. Then I remember another client. Amanda had been struggling to lose weight, cut down drinking and quit smoking. With a lot going on in her life she smoked and drank to numb her stress and unwind. Quitting smoking and losing weight were her goals. She achieved all of this and more. This included also giving up drinking! However, the journey took twelve months, not just two sessions! There aren’t many quick fixes on the road to true success and living an awesome life! I still see her from time to time, three years later, and she is still doing awesomely well and looks fantastic and happy. Obviously, there are some people who I don’t keep connected with, so I don’t know how they are going. Hopefully, they have achieved awesome things. However, there are a handful of people who I still see today who I know have not achieved the goals they wrote down many years ago. They gave up after one or two sessions, and I noted the main reasons:- ‘It’s not the right time,’ or ‘I have too much else going on in my life right now’ and the worst destroyer of dreams and transforming lives, ‘I can’t afford it.’ Wow. What a shame. However, I know that many people never even take that first step. I know a few inside secrets about change, so if you are struggling to change, here are a few reasons why change can be challenging. You are hardwired to look out for danger and to stay comfortable. So you have to go against your brain’s natural instinct. When you are thinking of change, about to change or offered an opportunity to grow you will feel fear or doubt. It’s normal! Your body automatically sends danger signals in the form of chemicals. This triggers your logical, rational head to get in the way and start analysing and justifying exactly why you shouldn’t change. Precisely what you are hard-wired to do. You waste a vast amount of energy making up reasons and excuses why it isn’t for you, or why you can’t change. Statements such as why it isn’t the right time, how you will start tomorrow, or wait until you have space in your life. (WARNING: this never happens. Time just is. It’s only you who chooses how to fill your time. Moreover, you choose what to focus to and attend to in the time you have.) So, most people take the easy option and put it off. And so the pattern continues. Change equals challenge. So the only way to grow is to push yourself out of your comfort zone which will be uncomfortable. Sometimes people try to change things all at once. This rarely works. Small steps are the way to go. Plus consistency, the essential ingredient. To help take that first step, take a few minutes to really connect with why you want to change. Next, drill down until you can connect with a driving emotion such as freedom, pride, joy, happiness. This is what you need to focus on. Not the hurdles, reasons and excuses that you haven’t even got to. Write down all the benefits of changing and all the negatives of staying where you are. Writing it down will help you see it from a different perspective. Then, take immediate action before your head gets in the way again! Whatever that is for you. Perhaps it’s the same as I did years ago and many of my clients have done? Mine was reaching out to an expert. Someone who has expertise in the field that you require help in. See if you are a good fit and then back yourself. Or, it could be joining a group of like-minded people to help and support you and keep you accountable? Take that first step and then another one. Commit to making a decision to give things a go and make sure you focus on becoming your very best. Get into action today. What is the motto that would help you how to change? Whatever you decide, please make a commitment today to pursue your goals and aspirations. Sit down with yourself and have a stern word. Remember, as my grandfather told me, life isn’t a dress rehearsal. You are here for a reason, so grab life and make the most of it! Here’s to your future success, whatever that looks like to you. Are you looking to discover more about your amazing mind and how you can harness its powers to be more consistent? 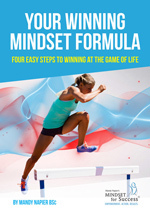 Then grab a copy of my free PDF guide Your Winning Mindset or check out my new 9 weeks Get Breakthrough Results online supported program.